In WordPress, choose Plugins from the left navigation and activate the Bitvolo integration plugin by clicking Activate inside the plugin row. If you don't see the plugin here, then the files were not saved in the correct location. Go to WooCommerce Settings / Checkout / Bitvolo and set your Bitvolo options. You'll need to enable Bitvolo, set your account ID and the secret key which you'll find in the account settings in the Bitvolo backend. You must also select the cryptocurrencies you wish to support. This is all that's needed to use Bitvolo in Wordpress / WooCommerce. You can of course offer multiple payment methods to your customers, e.g. 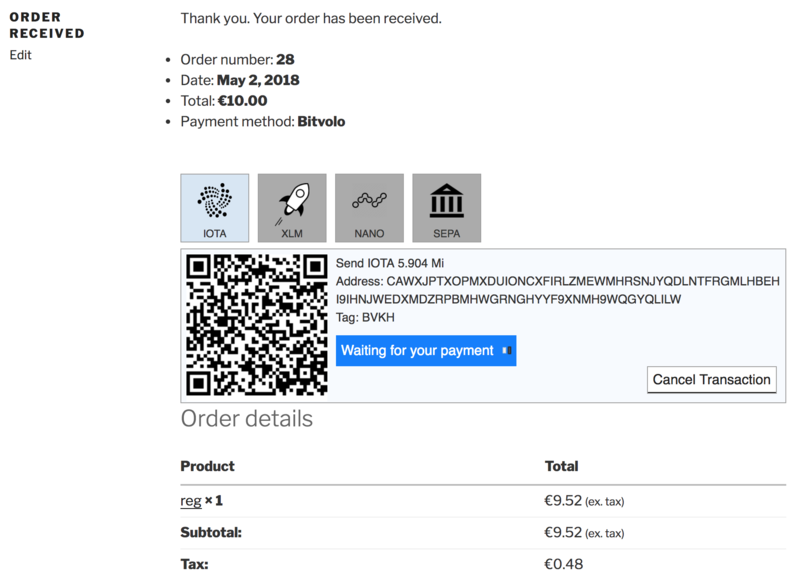 Bitvolo and Paypal.